When considering a mobility aid, rollators are regularly overlooked, despite being both practical and affordable to people with disabilities. They are a useful product to consider when purchasing a mobility aid for either you or a loved one. The following list provides six benefits to buying a rollator. placed in the boot of a car or other form of transport. Some models can also be used on rougher terrains which should appeal to adventurous types. When deciding on a walking aid, prices vary greatly across a wide variation of products. Crutches, scooters, knee walkers and rollators are just some of the items that can be taken into consideration when buying a mobility aid. The rollator is an affordable option for a wide range of disabilities. 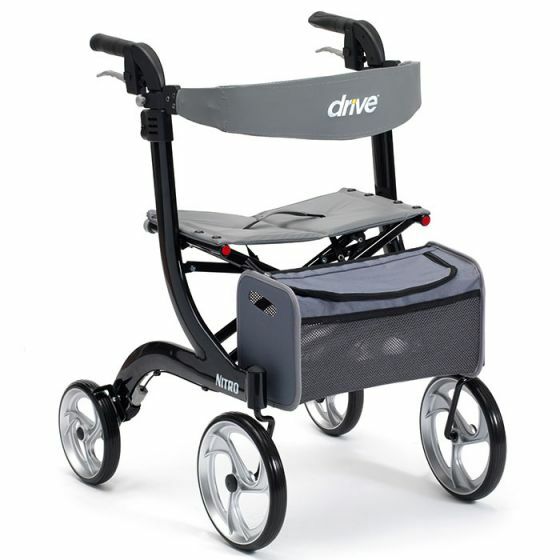 Whether the rollator is needed full-time or just occasionally, the purchase of this item is a solid economic choice. Most people considering rollators don’t contemplate that they can be used to sit on for both comfort and stability. They are useful in public venues, such as shopping centres, allowing the user to take a respite from shopping and rest their feet. Rollators are height adjustable. This means that the user can adjust the item to match their comfort and stability needs. Whether that person is short, tall or somewhere in between, the rollator can be calibrated to the necessary proportions and unique needs of its user. A person with a mobility disability is often under circumstances where they can’t exercise and remain active. Rollators allow their users to exercise independently and with confidence, due to the added support. Mobility aids are used by people who need assistance, occasionally to frequently, in remaining mobile. Whatever the case may be, it is always good to have a transportable one on-hand for whatever situation arises. We have a full range of rollators available – take a look here. We deliver them all over Ireland at the best value prices.